This delicate, aromatic soak with ginger extract softens cuticles and calluses and provides deep cleansing. Orange extract gives extra hydration to the skin. After treatment, skin is clean and ready for Luminous Peeling. 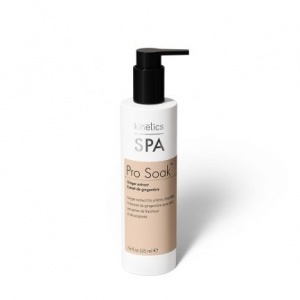 Enriched moisturizing formula completely conditions the skin. Deeply softens cuticles and calluses. Light, sophisticated fragrance leaves the skin fresh and soft. Dispense one pump for a manicure or two pumps for a pedicure into a bowl of warm water and soak off for five to ten minutes. Can also be used in whirlpool pedicure spas.